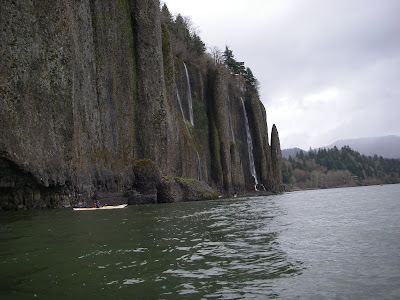 On a gray and sleety morning in late March an intrepid band of OOPS kayakers launched from Dalton Point on the Oregon side of the Columbia (near Multnomah Falls) headed toward Chinook Landing (near Fairview, Oregon). Tom Argent and Neil Schulman did a great job of organizing this trip. There were eight of us altogether: Tom, Neil, Mike, Bob, Kevin, Becky, Stacy and myself. We met and Chinook Landing and did all the shuttle stuff to get us and boats up to Dalton Point. We launched at appr 10am and paddled across to Phoca Rock. We explored around it a bit, then headed over to Cape Horn on the Washington side and really enjoyed exploring that area. The cliffs and waterfalls there were beautiful. As we left Cape Horn and headed west we got a bit of west wind, but not much. Maybe 8 mph. Sometimes it was there, sometimes not, til we got to Reed Island. We paddled on the north side of Reed Island to find a lunch spot. No wind at all on that side. By now it was warm and sunny. A very relaxing lunch. After lunch we headed to the west end of Reed Island then threaded our way through the maze of drift nets. I find it hard to believe that commercial salmon fishing with nets is still allowed in the Columbia given the precarious state of these salmon runs. Sure, commercial salmon fishing in Alaska still makes sense. But not on the Columbia. With millions of people out of work in this country it's impossible to justify keeping a couple thousand fishing jobs (at most) that threaten these fish with extinction. People will live. Extinction is forever. 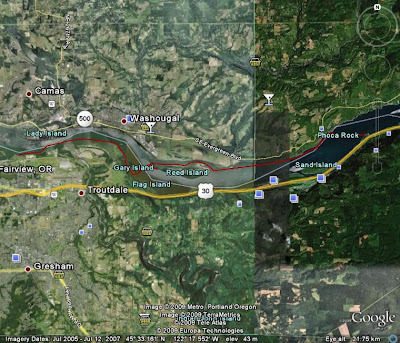 But eventually we crossed the Columbia and paddled behind Gary Island, then along the outside edge of the Sandy River Delta. While paddling in that shallow brush-filled water a large carp hurled itself at Stacy's boat. It made a "twack!" that was audible for quite a ways and a nice large splash! That really got her attention :) Just like the carp Kristin and I encountered in Scappoose Bay. From there it was on to a few large rocks (with power pylons on them) at Troutdale. We found a nice eddyline coming off one of those rocks and stopped there to play for awhile. A nice warm day, a fun little eddyline... life is good. But eventually it's time for all of us to get home so we headed west the now short distance back to Chinook Landing. We landed at appr 17:00. According to Mike's trusty GPS: 17.7 miles. A good day on the water.